Welcome to the eleventh guest blog post of Time Out Sydney's 52 Weeks of #SydCulture 2017 challenge! This month is a bit special: the lady who inspired this campaign, Kali Reid, is culture-selecting for us. Every Tuesday of March, Kali will be telling us what she loved the week before. Think of it as your recommendations for this week, from someone who sees a helluva lot of arts and culture. Over to her. 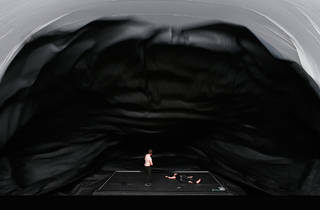 The audience is invited into the theatre space by means of a pitch-black tunnel that ends in an inflated white vaginal cavity. We all birth ourselves through it as best as we can, me somewhat trepidatious of what I would find on the other side. We take our seats, put headphones on and zone in. A binaural soundtrack beckons and a lilting voice coos in our ears: ‘We will take care of you’. My fears are apparently unfounded. This is Lady Eats Apple, the new show from Back to Back, a Geelong-based theatre company who have an international reputation for disarming new work (previous works include Ganesh Versus the Third Reich and Super Discount). I’ve never seen one of their shows before, but I’ve heard plenty about them. So I wasn’t completely surprised to encounter realms of the absurd, delicate nuanced performances, and dialogue that confronts the harsh realities of living with a disability. Lady Eats Apple explores mortality in three acts. It traverses original sin, near death experiences, intimacy and dealing with persistent prejudice. Being undervalued. Sharing space with others. And claiming your right to a higher calling. 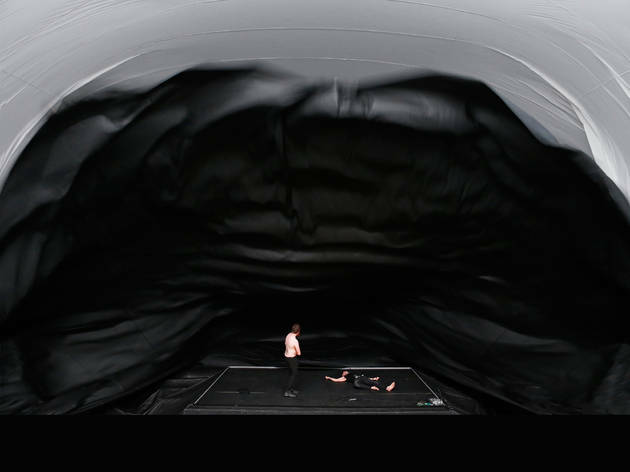 It plays with intimacy in a curious way, juxtaposing grandeur in the vastness of Carriageworks’ Bay 17 with the up close intimacy of hearing everything directly delivered into your ears via headphones. Everything is unromanticised and the effect is at times disorienting, in a good way. A number of people close to me are facing tough ordeals at the moment: issues with their health, or the health of those they love. It’s a confronting time, a nervous time, and also a time of incredible strength. Reflecting on this show over the weekend, I realise that this context was very much present for me as I watched the show. It’s rare to spend time with the fragility of our own existence, and even rarer to spend time in the space in between living and dying, described so beautifully in the show as a place of ‘pure love’. I appreciated the warmth and trust which was cultivated in Lady Eats Apple, and the way that it draws back the curtain again and again, allowing me to sit in this space, on the brink between what we know and what is ultimately unknowable. As an aside – Carriageworks has a new (free) exhibition opening next week – The National. Some works had already been hung when I was there on Thursday night and it’s well worth a look see. Lady Eats Apple ran March 16-18 at Carriageworks; see what’s coming up at the multi-arts venue. Read more about our 52 Weeks of #SydCulture challenge, and let us know what you're seeing/loving on Instagram via the hashtag #SydCulture. Kali Reid is a creative producer and curator working across live performance, digital media, television and the gallery. She was a co-founder of multidisciplinary arts space 107 Projects in Redfern, and has produced work for Sydney institutions including Sydney Festival, Campbelltown Arts Centre, Art & About, Underbelly Arts Festival, Carriageworks, Imperial Panda Festival and is currently working in scripted television development at Matchbox Pictures.